Diani & Devine Meet The Apocalypse is a new feature film by the comedy team of, wait for it, Diani & Devine. Actually it’s not a film yet, it’s a Kickstarter campaign with a glimmer in its eye and about two weeks to reach its goal. For a small film they’ve assembled an impressive cast of veteran actors including Barry Bostwick (The Rocky Horror Picture Show), Armin Shimerman (Star Trek Deep Space Nine), Janet Varney (Legend of Korra), and Harry Groener (Buffy the Vampire Slayer). Diani & Devine are releasing a new video each day while the campaign is on, including a series of “Apocatips” (helpful hints for a better end of the world) and this endorsement by Mark Twain–whose death was previously exaggerated. While these guys have yet to rendezvous with the end of the world they are previously acquainted with Kickstarter (and Mark Twain). Last year they successfully raised funds for a theatrical release of their film The Selling about a real estate agent trying sell a haunted house. Their first Kickstarter effort in 2011 was a pitch to publish a new edition of Mark Twain’s Adventures of Huckleberry Finn which substituted the word “robot” for the word “N-word” to make everyone more comfortable and avoid confronting some of “the inconvenient facts about our country’s past”. 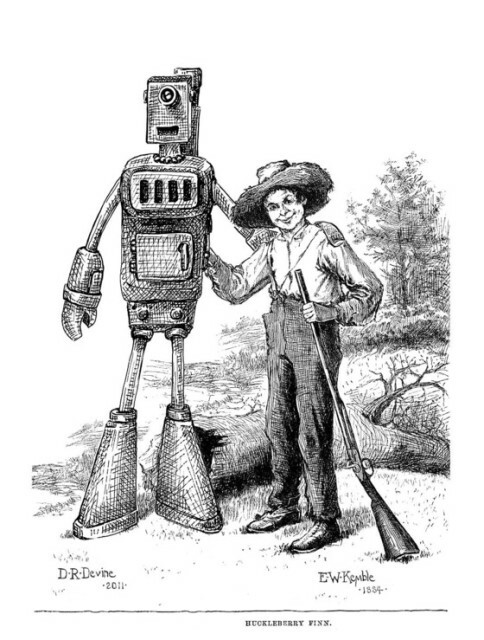 That very funny, satirical proposition brought in 5 times their goal and helped them print hardbound copies complete with new illustrations of “Robot Jim” by Denise Devine to augment the original drawings by E. W. Kemble. Twain’s book has been in the public domain since 1942. For their latest apocalyptic cinematic undertaking, you can imagine the t-shirts and downloads and signed headshots of the cast and other unimaginable gifts they are offering to their supporters. Their Kickstarter has raised about a quarter of the $100,000 they need. But if they don’t make it, will it be the end of the world?